Rifftides welcomes another contribution from Mr. Sultanof, a scholar cherished by the US music community for his expertise on big bands, arranging and composing, fields in which he is also a respected practitioner. He has analyzed, studied, edited and taught the music of Gerald Wilson, Robert Farnon, Harry Warren, Russell Garcia, Gerry Mulligan and Miles Davis, among others. The Rifftides staff is honored to present Mr. Sultanof’s thoughts about the importance of Benny Carter. Writing an article on a legendary figure in any field is relatively easy. There are accomplishments to cite, individual artistic highlights to describe, and maybe a juicy scandal or two. 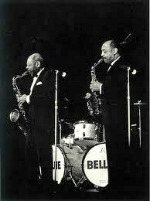 Benny Carter is certainly a legend, but he created great art with no fanfare and no personal issues. His recordings yielded no hits that the general public associates with him. Yet most of the readers of these words know that he is right up there with the finest saxophone and trumpet pioneers in the history of jazz, and that he was one of American popular music’s pioneer arranger/composers, alongside such names as Ellington, Fletcher Henderson. Don Redman, John Nesbitt and Bill Challis. This piece only sketches the history of his life, as details are easily found elsewhere, particularly in Ed Berger’s incredible two-volume bio-discography of Carter. But it does share some personal memories, and more importantly, reports that Mr. Carter may finally have broken through to the most important audience he could possibly have. Benny was born in New York in 1907, and was playing alto saxophone in public by the time he was fifteen. He began contributing arrangements to bands, and by the beginning of the depression was one the leading arrangers in popular music. By 1933, he had mastered the trumpet and is one of those rare musicians whosesolos on horns from more than one instrumental family are considered classics. He organized his first band in 1932 and was always able to attract excellent musicians. A young Canadian composer named Robert Farnon credited Carter with showing him that the arranger wrote a score first and then copied the parts; at the time, Farnon did not know that there was such a thing as a score; stock arrangements did not include them. Carter continued his career in Europe in the mid-thirties, and soon he was writing for the BBC Dance Orchestra. 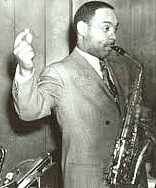 He wrote, played and recorded in Europe for three years, often working with other expatriates such as Coleman Hawkins. In 1938, he returned to the U.S. and led another excellent band, but once again, because he never had a hit record, he was leading a small group by 1941. Along the way, he was writing for bands led by Glenn Miller, Tommy Dorsey, Gene Krupa, and Benny Goodman. In 1942, he started yet another big band on the west coast that lasted four years. Instrumentalists included Miles Davis, J.J. Johnson and Art Pepper, all of whose careers Carter encouraged. In 1943, Alfred Newman, head of music at 20th Century-Fox, needed an arranger for the film Stormy Weather with Bill “Bojangles” Robinson and Lena Horne. Newman hired Carter, who did such an excellent job that he was regularly called to do work at Fox while he continued to lead his band. Though he was not the first black arranger to work in Hollywood (Will Vodery, William Grant Still and Phil Moore preceded him), he was perhaps the first to break the stereotype of black arrangers being used only for ‘exotic’ (i.e. jungle or primitive) music or jazz. Newman recognized that Carter could write and play anything. That points up what was special about Benny’s music; it ranged wide through musical styles. “Symphony in Riffs” was in many important dance band books, “Cow Cow Boogie” was a huge hit for the pop/jazz/country crossover artist Ella Mae Morse. “Key Largo” was a ballad covered by many artists after Anita O’Day (pictured) popularized it. His music is also harmonically interesting, fun to play and often challenging. His choruses for saxophone section (“Lonesome Nights” and “All of Me” are two of the best) are still models for such writing; sax players love practicing them because they are well-written for the instruments and beautiful to hear. For many years, Benny juggled between playing and writing assignments for recordings, television and motion pictures, but during the 1970s, his playing career entered a new phase, and he became busy playing concerts and festivals. Ed Berger became his manager, and even produced some of his later recordings. In the mid-1990s, I was working for Hal Leonard Corporation as an editor and consultant. A book of Carter’s songs and solos was already in production when I first joined the company, but Ed Berger was determined that I work with Benny. I suggested that the many Carter arrangements and compositions that Benny kept in his garage should finally be edited and published. In my view, if Ellington’s music was available, certainly Carter’s work was just as important, and I was not the only one who believed that. Eventually, Jazz at Lincoln Center did publish some Carter compositions, but they were often transcriptions. In the second installment of Jeff’s appreciation of Benny Carter, he recounts his visit with the Carters in Los Angeles and discloses the nature of the new audience that is helping to expand Benny’s living legacy. Unaccountably and unforgivably, the Sony combine that acquired RCA Records has allowed a CD with recordings of Carter’s masterly scoring to go out of print. It contains the “All of Me” that Jeff mentions. Amazon has two new copies in stock for $85 dollars each. That price is the bad news. The good news is that Amazon also lists a number of used copies of that invaluable album at a tiny fraction of the cost of a new one. Due to an operation and rehab stay in the family I missed this blog entry when it first was published. It contains no YouTube reference so I decided to add one. I’m not familiar with a lot of Benny Carter’s work, but this example sounds very good, with excellent solos by all involved. Ronnie Bedford, drums. Jazz at the Smithsonian, 1982.